The Miller Tanner difference is our people. That’s why we want to introduce you to our team of superstars that brings our corporate meetings and events to life for our clients. 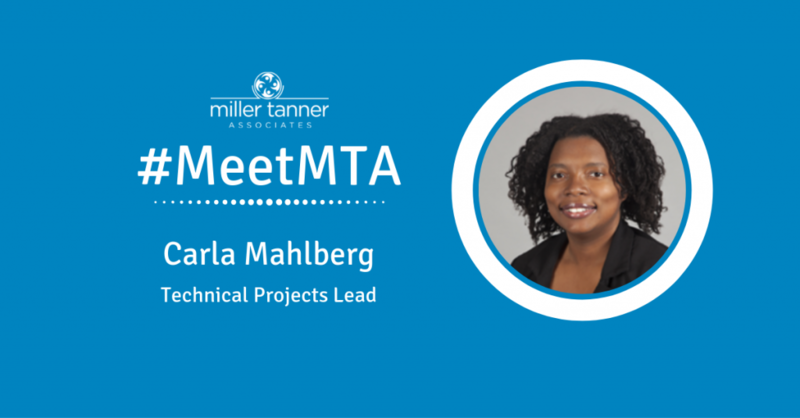 Today we introduce you to Carla Mahlberg, Technical Projects Lead. Carla brings her versatile technology skill set to our Technology Services Team ensuring that all in-house software projects are delivered on target. Tell us about your current role with Miller Tanner Associates (MTA)? I am the technical projects lead which means that my job is never boring. I am always trying to figure out ways to get the job done. My primary function is to assist with keeping tasks for in-house software projects on schedule so that requests are not only functional but delivered in a timely manner to our stakeholders. I also conduct training as needed on software. How long have you been with MTA? I have been with MTA for 5 years in July, and I am very grateful to be part of this amazing team. I have been part of the technology industry for several years. I guess it’s in my DNA. I love figuring things out as I am more of a hands-on learner. Before MTA, I worked for another company in their Technical Department. I started with the Help Desk Team, and transition into their Development Team as a junior developer, and now I am here at MTA with the opportunity to bring my mix of skills to the team. I love how nothing is the same each day; when I log on, I never know what is coming down the pike. It’s ever-changing and challenging, and I really like that. I also love interacting with my team and seeing how the things that I am working on contribute to their work. Where do you live and what do you love most about your state/city? Any must-see tourists spots? I live in Tennessee, not far from Nashville. I love the rolling hills and how green it is. I think everyone should visit Chattanooga, TN; it’s one of my favorite spots because it offers a lot for everyone no matter the age. I also love the Tennessee state parks which are beautiful. What do you do for fun? I enjoy being with my family, reading, and researching things pertaining to our world. I love learning. What are some of your favorite tech trends? Even though I love working in technology, I don’t have a huge list of tech trends. I do believe that automation is the future, and I love how Miller Tanner has used automation to its benefit. We have consolidated time-consuming tasks by automating them with workflows, allowing us to be more efficient in how our systems operate. The people are what make Miller Tanner stand out as a meeting planning company, of course! If anyone is looking for a meeting management company that will get the job done but treat you with respect, going above and beyond to give you a meeting experience that you will never forget – then Miller Tanner will meet that expectation. Miller Tanner offers a plethora of knowledge, tools, and experience to produce and manage a meeting seamlessly.